This paper presents a sampling-based RBDO method using surrogate models. The Dynamic Kriging (D-Kriging) method is used for surrogate models, and a stochastic sensitivity analysis is introduced to compute the sensitivities of probabilistic constraints with respect to independent or correlated random variables. 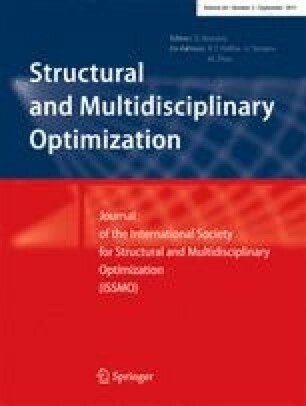 For the sampling-based RBDO, which requires Monte Carlo simulation (MCS) to evaluate the probabilistic constraints and stochastic sensitivities, this paper proposes new efficiency and accuracy strategies such as a hyper-spherical local window for surrogate model generation, sample reuse, local window enlargement, filtering of constraints, and an adaptive initial point for the pattern search. To further improve computational efficiency of the sampling-based RBDO method for large-scale engineering problems, parallel computing is proposed as well. Once the D-Kriging accurately approximates the responses, there is no further approximation in the estimation of the probabilistic constraints and stochastic sensitivities, and thus the sampling-based RBDO can yield very accurate optimum design. In addition, newly proposed efficiency strategies as well as parallel computing help find the optimum design very efficiently. Numerical examples verify that the proposed sampling-based RBDO can find the optimum design more accurately than some existing methods. Also, the proposed method can find the optimum design more efficiently than some existing methods for low dimensional problems, and as efficient as some existing methods for high dimensional problems when the parallel computing is utilized. Research is jointly supported by the ARO Project W911NF-09-1-0250 and the Automotive Research Center, which is sponsored by the U.S. Army TARDEC. These supports are greatly appreciated.